An introductory paragraph, as the opening of a conventional essay, composition, or report, is designed to grab people's attention. It informs readers about the topic and why they should care about it, but also adds enough intrigue to get them to continue to read. In short, the opening paragraph is your chance to make a great first impression. The primary purpose of an introductory paragraph is to pique the interest of your reader and identify the topic and purpose of the essay. It often ends with a thesis statement. You can engage your readers right from the start through a number of tried and true ways. Posing a question, defining the key term, giving a brief anecdote, using a playful joke or emotional appeal, or pulling out an interesting fact are just a few approaches you can take. Use imagery, details, and sensory information to connect with the reader if you can. The key is to add intrigue along with just enough information so your readers want to find out more. One way to do this is to come up with a brilliant opening line. Even the most mundane topics have aspects interesting enough to write about; otherwise, you wouldn't be writing about them, right? When you begin writing a new piece, think about what your readers want or need to know. Use your knowledge of the topic to craft an opening line that will satisfy that need. You don't want to fall into the trap of what writers call "chasers" that bore your readers (such as "The dictionary defines...."). The introduction should make sense and "hook" the reader right from the start. 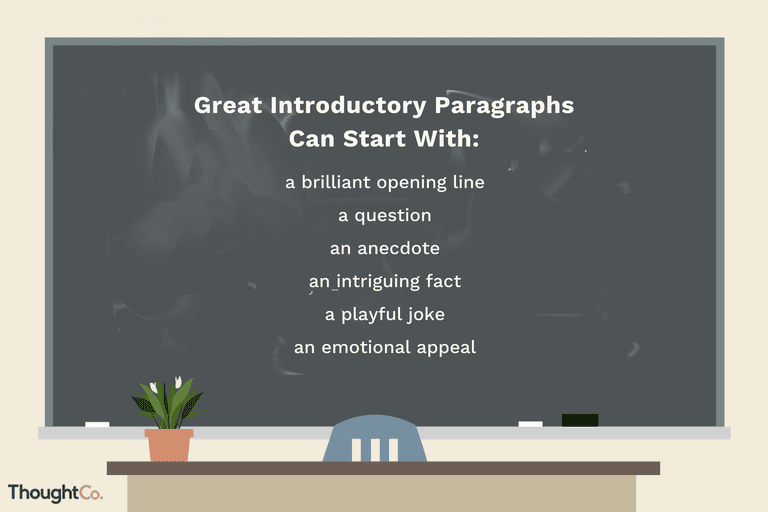 Make your introductory paragraph brief. Typically, just three or four sentences are enough to set the stage for both long and short essays. You can go into supporting information in the body of your essay, so don't tell the audience everything all at once. Keep in mind that you can always adjust your introductory paragraph later. Sometimes you just have to start writing. You can start at the beginning or dive right into the heart of your essay. Your first draft may not have the best opening, but as you continue to write, new ideas will come to you and your thoughts will develop a clearer focus. Take note of these and, as you work through revisions, refine and edit your opening. If you're struggling with the opening, follow the lead of other writers and skip it for the moment. Many writers begin with the body and conclusion and come back to the introduction later. It's a useful, time-efficient approach if you find yourself stuck in those first few words. Start where it's easiest to start. You can always go back to the beginning or rearrange later, especially if you have an outline completed or general framework informally mapped out. If you don't have an outline, even just starting to sketch one can help organize your thoughts and "prime the pump" as it were. You can read all the advice you want about writing a compelling opening, but it's often easier to learn by example. Let's see how some writers approached their essays and analyze why they work so well. "As a lifelong crabber (that is, one who catches crabs, not a chronic complainer), I can tell you that anyone who has patience and a great love for the river is qualified to join the ranks of crabbers. However, if you want your first crabbing experience to be a successful one, you must come prepared." What did Mary do in her introduction? First of all, she wrote in a little joke, but it serves a dual purpose. Not only does it set the stage for her slightly more humorous approach to crabbing, but it also clarifies what type of "crabber" she's writing about. This is important if your subject has more than one meaning. The other thing that makes this a successful introduction is the fact that Mary leaves us wondering. What do we have to be prepared for? Will the crabs jump up and latch onto you? Is it a messy job? What tools and gear do I need? She leaves us with questions, and that draws us in because now we want answers. "Working part-time as a cashier at the Piggly Wiggly has given me a great opportunity to observe human behavior. Sometimes I think of the shoppers as white rats in a lab experiment, and the aisles as a maze designed by a psychologist. Most of the rats—customers, I mean—follow a routine pattern, strolling up and down the aisles, checking through my chute, and then escaping through the exit hatch. But not everyone is so dependable. My research has revealed three distinct types of abnormal customer: the amnesiac, the super shopper, and the dawdler." This revised classification essay begins by painting a picture of an ordinary scenario, the grocery store. But when used as an opportunity to observe human nature, as this writer does, it turns from ordinary to fascinating. Who is the amnesiac? Would I be classified as the dawdler by this cashier? The descriptive language and the analogy to rats in a maze add to the intrigue, and readers are left wanting more. For this reason, even though it's lengthy, this is an effective opening. "In March 2006, I found myself, at 38, divorced, no kids, no home, and alone in a tiny rowing boat in the middle of the Atlantic Ocean. I hadn’t eaten a hot meal in two months. I’d had no human contact for weeks because my satellite phone had stopped working. All four of my oars were broken, patched up with duct tape and splints. I had tendinitis in my shoulders and saltwater sores on my backside. "I couldn’t have been happier...."
Here we have an example of reversing expectations. The introductory paragraph is filled with doom and gloom. We feel sorry for the writer but are left wondering whether the article will be a classic sob story. It is in the second paragraph where we find out that it's quite the opposite. Those first few words of the second paragraph—which a reader cannot help but skim—surprise us and thus draw us in. How can the narrator be happy after all that sorrow? This reversal compels us to find out what happened. Most people have had streaks where nothing seems to go right. Yet, it is the possibility of a turn of fortunes that compels us to keep going. This writer appealed to our emotions and a sense of shared experience to craft an effective read.